There is no comment more troubling to the mother of a young girl than "She loves you now, but just wait 'til she's a teenager." The new discovery is that teen girls need - and secretly want - a close connection with their mothers, and that you can keep the loving relationship with your daughter that you have when she is little right through her teen years. 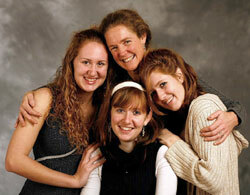 Ten years ago, SuEllen Hamkins, M.D., and Renée Schultz, M.A., psychotherapy professionals with a combined forty years' experience and both mothers of then seven-year-old daughters, founded The Mother Daughter Project with other women in their community, with the hope of disproving the damaging assumption of mother-daughter disconnection. With their young daughters, the group met regularly to speak frankly about such issues as girls' friendships (and aggression), puberty, and the media's influence on self-image, drugs, and sexuality. As their daughters matured, the mothers marveled at the strength and confidence with which the girls thrived through adolescence. It was clear the Project had succeeded in creating a haven from the perils of teen culture. But equally important, the support the Project offered mothers helped them navigate their own concerns about adolescence with integrity and grace. 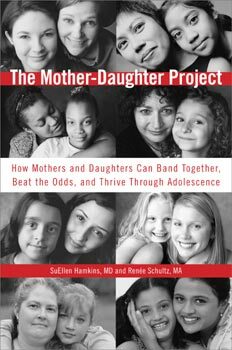 At once simple and revolutionary, this book details the success of the Mother-Daughter Project's groundbreaking model, providing the reader with a roadmap for strengthening her bond with her own daughter, and providing strategies for staying close through adolescence and beyond. Hamkins and Schultz begin with an insightful look at what today's mothers and daughters are up against, from the current social pressure teen girls face to the "myth of the Supermom". ("In order to best care for their daughters, mothers need to first take care of themselves," the authors explain.) From here, each chapter is dedicated to guiding you through a different age in your daughter's childhood and adolescence - beginning when she is seven and concluding at seventeen - offering fun, practical, age-specific exercises and advice, for everything from teaching your daughter to genuinely love her body to instilling in her the importance of both safety and freedom. Whether you are interested in starting a mother-daughter group in your own community or would simply like to ensure a close relationship with your daughter as she grows up, this groundbreaking book will show you the way.